This is a Tex-Mex version that comes close to the chicken fajitas we have had several of our favorite Mexican restaurants in Houston. Adobo Seasoning is a key ingredient, but I do not recommend Goya (their other products I use and do recommend). Try adobo seasoning from Penzeys or MySpiceSage that can be ordered online or get some from your bulk spice section. If you can’t get the spice do make them they will still taste great. It took me several rounds before I discovered this key ingredient and everyone still enjoyed them without the adobo seasoning. Green peppers and onions are a traditional Tex-Mex combination, but I have added two other varieties that we enjoy. Serve this with my Beef Fajitas recipe for a great fajita party! In medium bowl whisk all ingredients for marinade, except for chicken. In a large baking dish or large Ziplock bag add chicken and marinade and massage marinade into chicken. Cover baking dish or close bag and let marinate overnight or for at least 6 hours. Massage bag every so often to insure consistent marinating. One hour before serving make peppers and onions. Use foil or separate baking dishes for each pepper and the onion. Add the sliced onions and peppers to each large piece of heavy duty foil or baking dish and add 1 tablespoon of oil to each pepper dish and 1/4 cup of oil to the onion dish. Bake in a preheated oven at 375 degrees for 30 minutes or until each vegetable is tender. The peppers may take less time and the onion may take more time. Preheat a grill to medium high and grill for 10 minutes on each side. Remove from grill and let rest for 15 minutes. After chicken has rested, slice and serve. Cooking times will vary depending on the thickness of the chicken and the type of grill you are using. Make sure that no pink is present in the chicken. 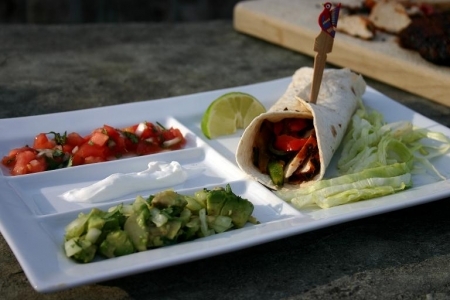 Serve chicken, onions and peppers along with the accompaniments to make a great fajita! A margarita – try my Classic Margarita, Prickly Pear Margarita or Guava Margarita or a Mexican beer try – Modelo especial, Dos Equies, Corona with a wedge of lime. For kids try Sidral Mundant, which is an apple soda, Sidral Manzana Verde, which is a green apple soda and Barrilitos Fruit Punch. These can be found in the Ethnic section of most large grocery stores or in Mexican stores.